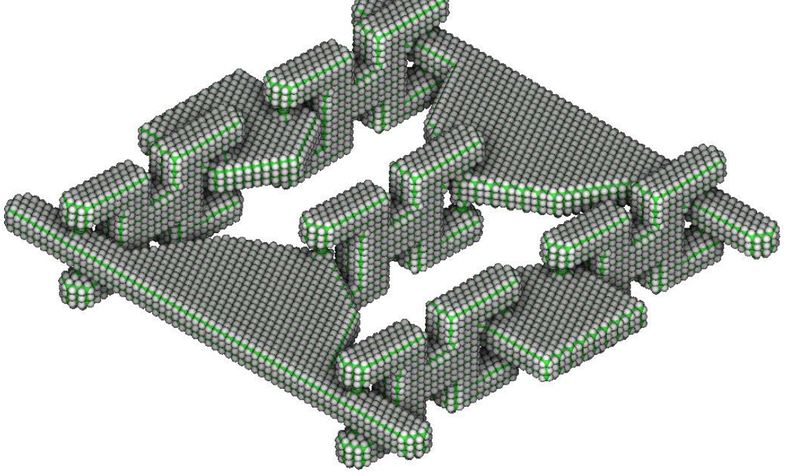 Ralph Merkle, Robert Freitas and others have a theoretical design for a molecular mechanical computer that would be 100 billion times more energy efficient than the most energy efficient conventional green supercomputer. Removing the need for gears, clutches, switches, springs makes the design easier to build. Existing designs for mechanical computing can be vastly improved upon in terms of the number of parts required to implement a complete computational system. Only two types of parts are required: Links, and rotary joints. Links are simply stiff, beam-like structures. Rotary joints are joints that allow rotational movement in a single plane. 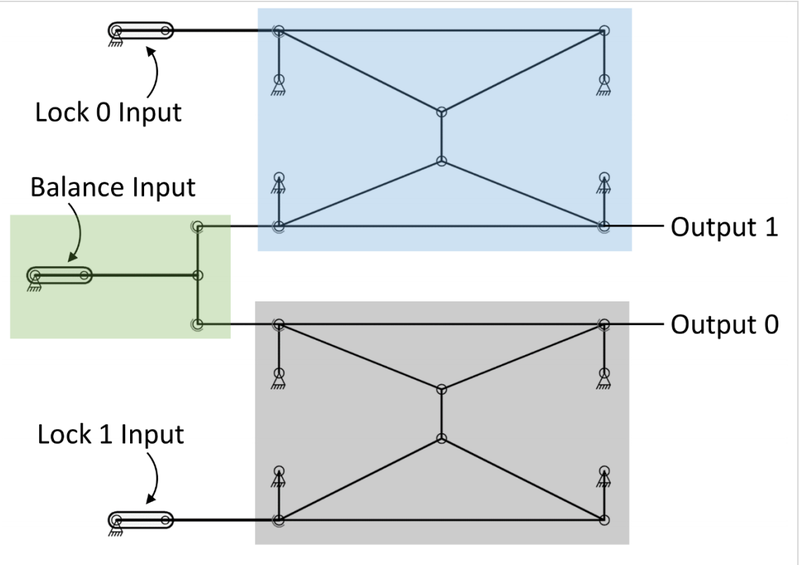 Simple logic and conditional routing can be accomplished using only links and rotary joints, which are solidly connected at all times. No gears, clutches, switches, springs, or any other mechanisms are required. An actual system does not require linear slides. The “simple logic” approach is perhaps more useful for routing data. It is possible to create all necessary logic using nothing but locks and balances (and a few extra links and rotary joints to route and/or copy data). Any traditional 2-input logic gate, including AND, NAND, NOR, NOT, OR, XNOR and XOR, can be created directly from the appropriate combination of locks and balances. 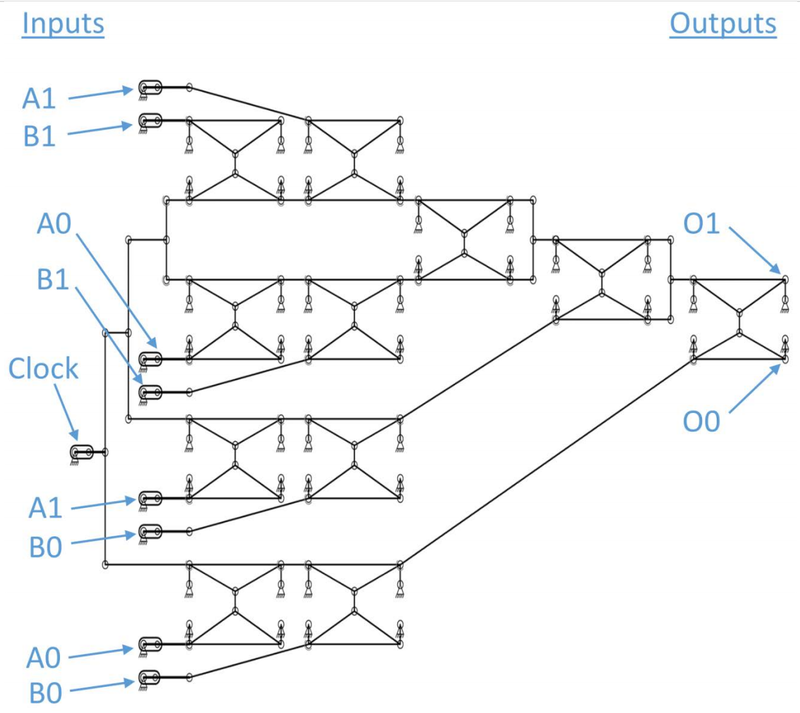 A balance- and lock-based NAND Gate, using a two-link per bit input/output design, and duplicated inputs for diagrammatic clarity. It has long been known that, in theory, computing processes can be made arbitrarily energy-efficient. The power and heat problems which plague current computers stem from the use of inefficient computing elements (e.g., electronic transistors), not fundamental principles of physics (which indicate that computations can take essentially zero energy). While essentially all modern computers are electronic, computers can also be implemented mechanically. Power consumption in electronic computers versus mechanical computers stem from fundamentally different phenomenon. Power consumption in an electronic computer is proportional to electrical resistance, while power consumption in a mechanical computer is proportional to friction. A new design paradigm for mechanical computers has been created which not only vastly simplifies the design of mechanical computers, but relies solely upon mechanisms with very low friction. 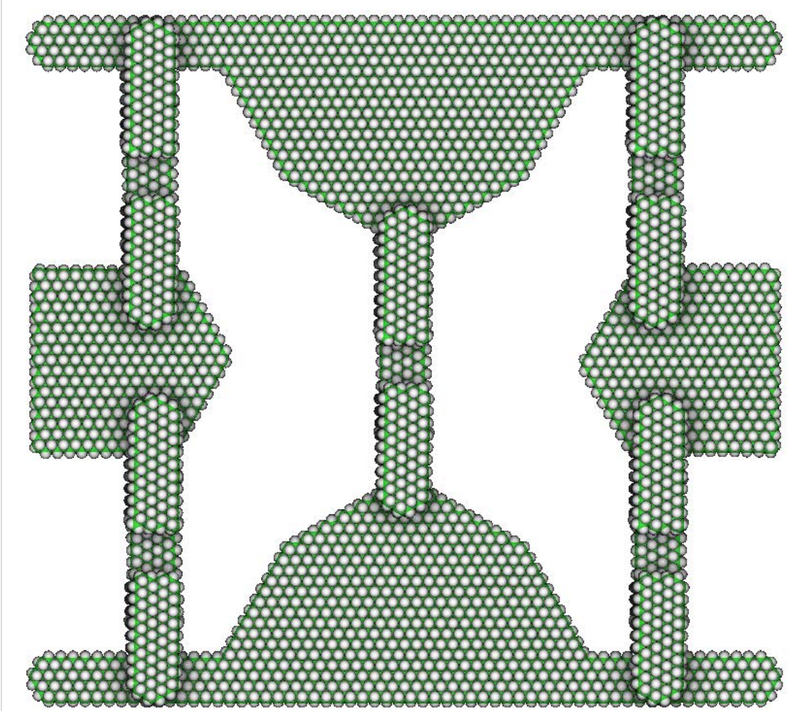 An analysis of the potential capabilities of a mechanical computer based on this new design paradigm shows that, in a properly designed molecular-scale mechanical computer, friction consumes far less energy than electrical resistance. As a consequence, a mechanical computer designed as described herein has the potential to provide 10^12 GFLOPS/Watt, over 10^11 times more efficient than conventional “green” supercomputers, which currently provide about 7 GFLOPS/Watt. The Landauer Limit of 4 x 10^-21 J per logical operation is quite large compared to the energy lost to friction via a NAND gate of the link- and rotary-joint style (3.9 x 10^-26 J per logical operation). It makes little sense to have such an efficient mechanism, but to then operate it in such a manner that power losses due to bit erasure reduce its effective efficiency by several orders of magnitude. Reversible computing is a well-known way to circumvent the Landauer Limit. Using reversible computing schemes, bits are stored, even if technically no longer needed to produce the final output, so that the penalty associated with bit erasure is not incurred. It would be trivial to modify the described NAND gate to be reversible. Further, there are well-known gates that are inherently reversible. Such reversible gates include the Toffoli gate and the Fredkin gate. And, not only are these gates reversible, but, like the NAND gate, they are universal. Meaning, given the appropriate configuration of, e.g., Fredkin gates, any desired logic can be implemented. These gates, like the more common irreversible gates already discussed, are readily implemented using only rotary joints and links. These are early designs; almost arbitrary implementations of the new design paradigm just to show proof of concept. The designs presented have not been optimized, nor have they been vetted at all possible scales. Various avenues of research are still being pursued. For example, it is assumed that the links in a lock pivot 1 radian when moving between the 0 and 1 positions. Can this movement be substantially reduced while maintaining reliable device functioning? If so, speed and energy benefits result directly from such an improvement. Can the frequency of the mechanisms be substantially increased? Probably. Compared to the 18 GHz resonance frequency calculated, the assumed 0.1 GHz operating frequency is very low and was chosen to err on the side of caution. The maximum working frequency for the designs shown, or for future, more optimized designs, may be much higher.